Having such a small apartment, I always struggle with space. 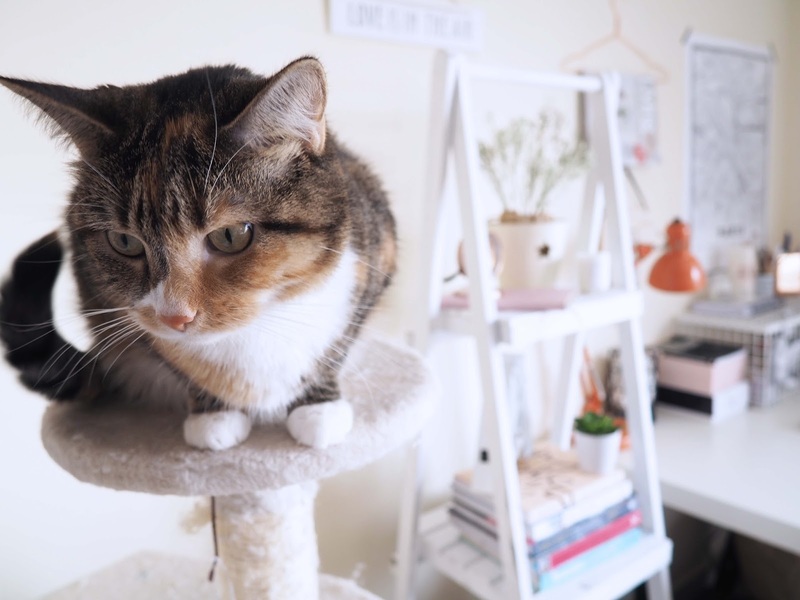 I was watching other bloggers styling their amazing mantelpieces or impressive large bookcases with pretty vases, books and ornaments with that little envy feeing inside. I could do nothing, as I already have so much furniture here I couldn’t block it with a large bookcase neither I can drill holes for shelves. 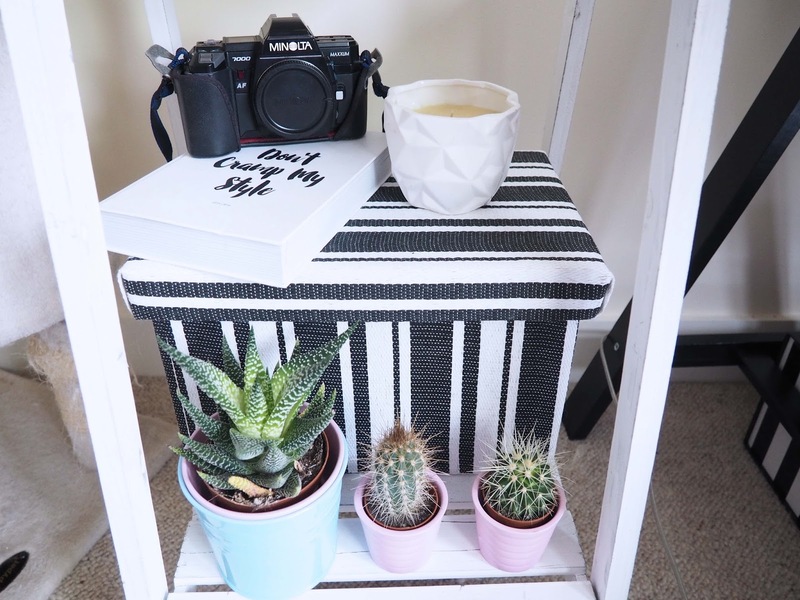 So, I have collaborated with Wayfair.co.uk to show you how to create smart storage and pretty #SpringShelfie at same time! 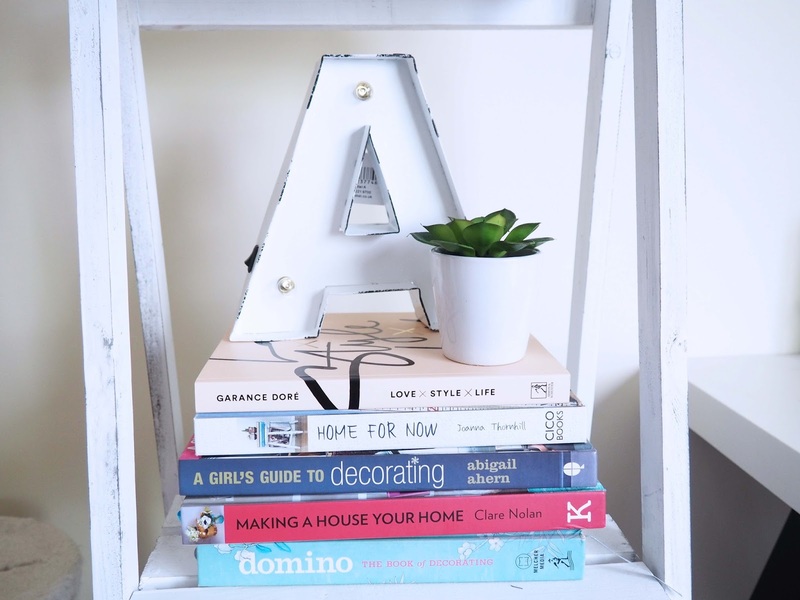 I want to show you how to style it and make it look just right, so you have that extra storage you need, a bookcase and pretty shelving to display your ornaments in a tiny space! Challenge accepted, hey! Wayfair is one of my favourite online stores where you can buy so many pretty decorative items, furniture and amazing lighting in totally affordable prices! I have my lovely desk corner I recently created, but I was lacking a storage there. I got some storage boxes from my favourite Homesense store to place under my desk, to keep all my craft pieces and paints but I needed proper shelves! 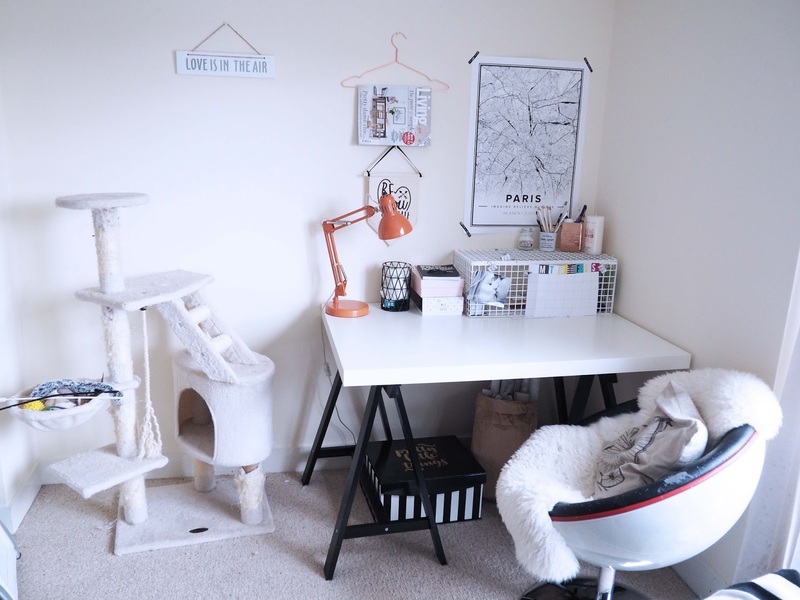 Since my cat scratch post takes up a lot of space there already, I was struggling to find a nice shelving unit that would go with my style and not make this space feel more ‘occupied’. It was actually quite a challenge to add more furniture to such a small space as this easily would create ‘’cluttered’’ type of room. Determine type of furniture. 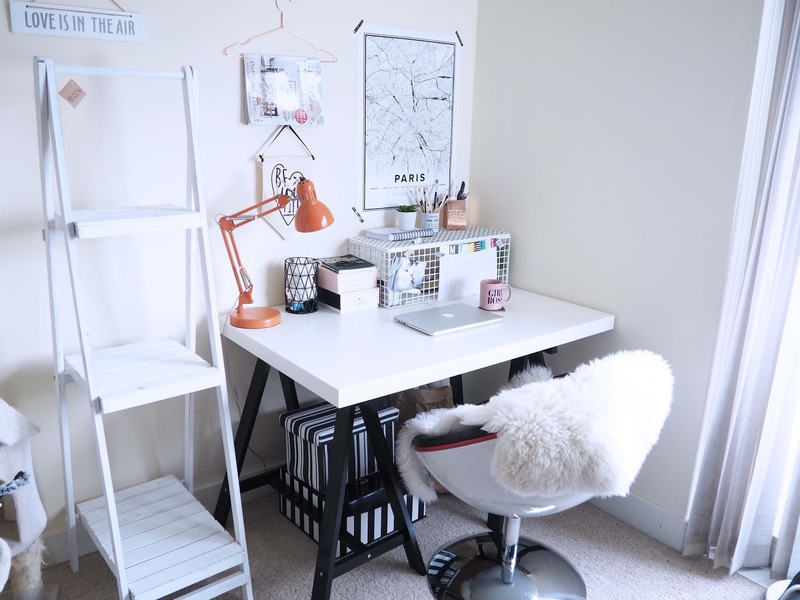 What type of furniture you have in your room already? I know, there is so many really cool types of bookshelf! Don’t be tempted by this cool geometrical if you have traditional furniture style. Keep same style and perhaps check leg type ( read my guide to french chic style furniture) I have chosen mine based on legs next to my desk. Colour. Remember, don’t mix too many wood colours. If your furniture are beach don’t be tempted by this nice oak shelving, especially if your flooring is wooden already! Dimensions. Always, always & always measure. The height, the width and depth! Buying bookcase may be easy, returning it.. not so easy! some companies offer free collect service.. some! Not all and often you end up spending quite a load of your money for courier service. Styling your Spring Shelfie. 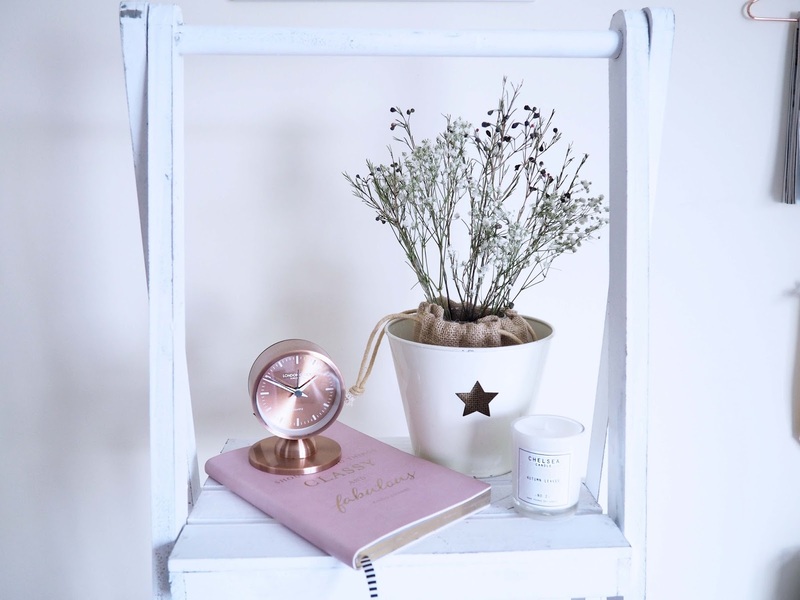 This may sounds simple, but to create the perfect looking shelf you need to take few things int considerations. Texture and colour. You want to look into different variations of textures. This will create more interest. You don’t want to go for just all glossy like glass ornaments you can add metal, wood, patterns etc. mix stripes with green plants and i also added some pastels! You can create your favourite colour scheme as well. I added pink and copper, of course! Detail. This is crucial! You want to get the right detail there but not over clutter your shelf! If you already chosen what is going up on your shelf, thats good. Think again of number 1 and textures. Once you sorted that, then check your items closely. 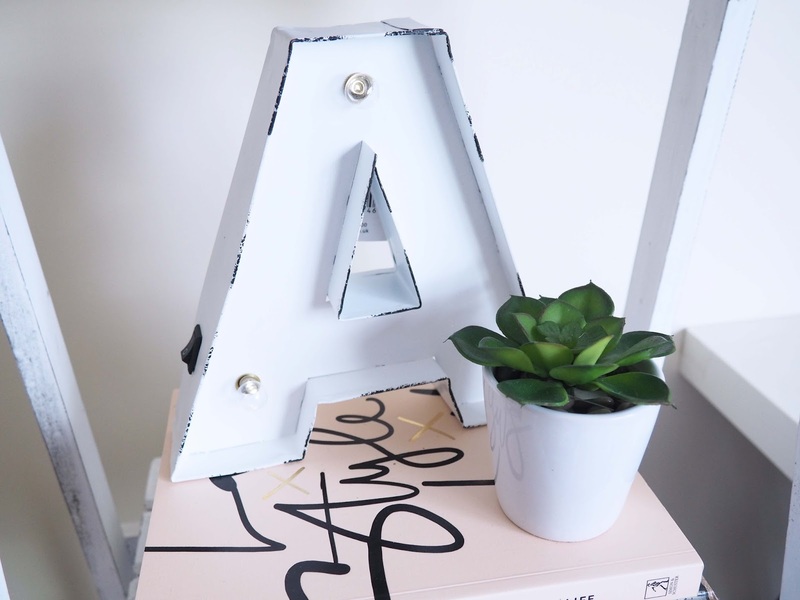 Personalise!I have chosen my A retro block letter lamp because of 2 things, A as Anna of course as first letter of my name, then A as I am madly in love with typography and pretty little liars! I have love for geometry so therefore, my geometrical candle look place next to. 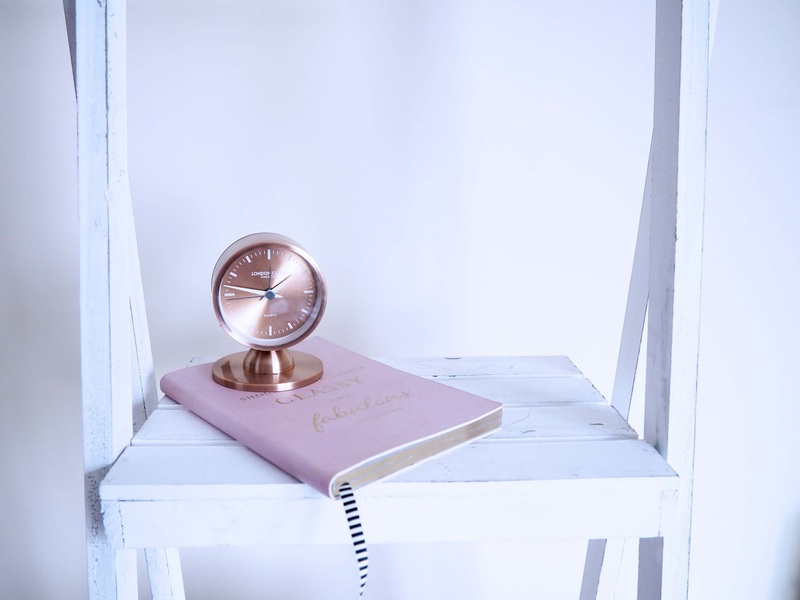 I wouldn’t forget my books of course and mixed this amazing Urban Luxe alarm clock in copper! I also found a first type of dslr in vintage shop for like £7 so decided to place it on my shelf! Plants. You do have to add some nature to your Spring Shelfie! You can add fresh flowers of course! I unfortunately have 2 furry trouble makers, whose scratch post is right next to so I had to say no to bucket of fresh flowers but you do as much as you can! I have instead opted for small gypsohilplia type of plants. 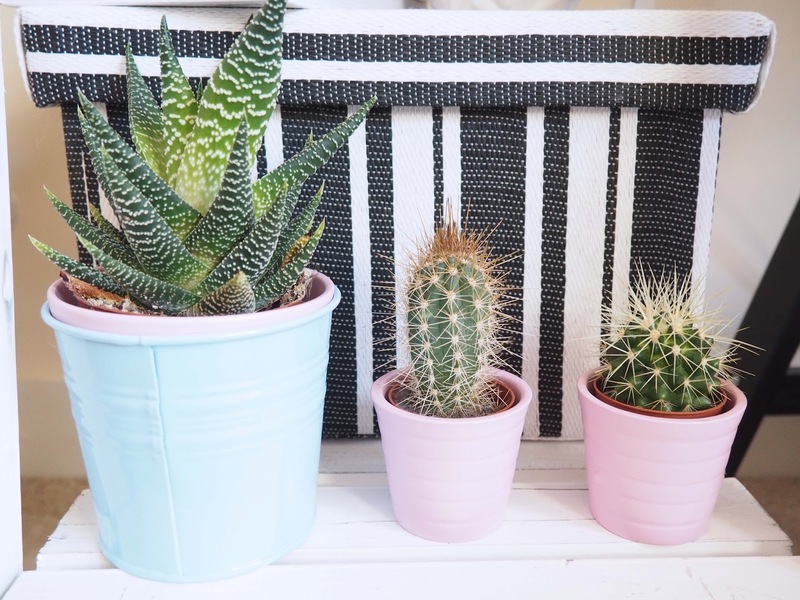 I have instead opted for small cactuses, which I have confidentially place then on the bottom as I know my cats will keep away and also after placing my stripy storage box from Homesense, I had little space there. I have browsed though an amazing items of Wayfair to find the solutions. I have compared several units and measures quite a lot. After a little while I have finally found what i wanted. I opted for Narrow Accent Shelves by Hill interiors. 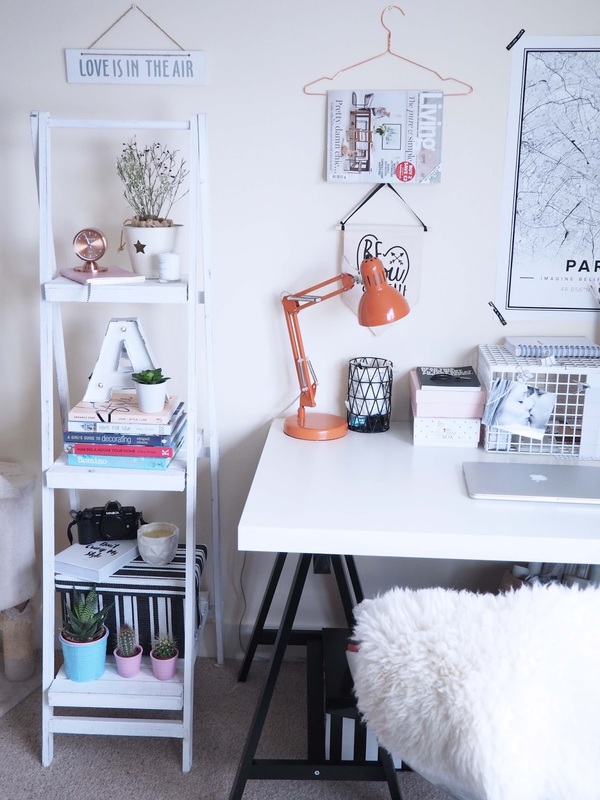 I loved the fact that is like ladder type shelf unit as legs of my desk are rather painter table so this matched perfectly! I started with placing my items. 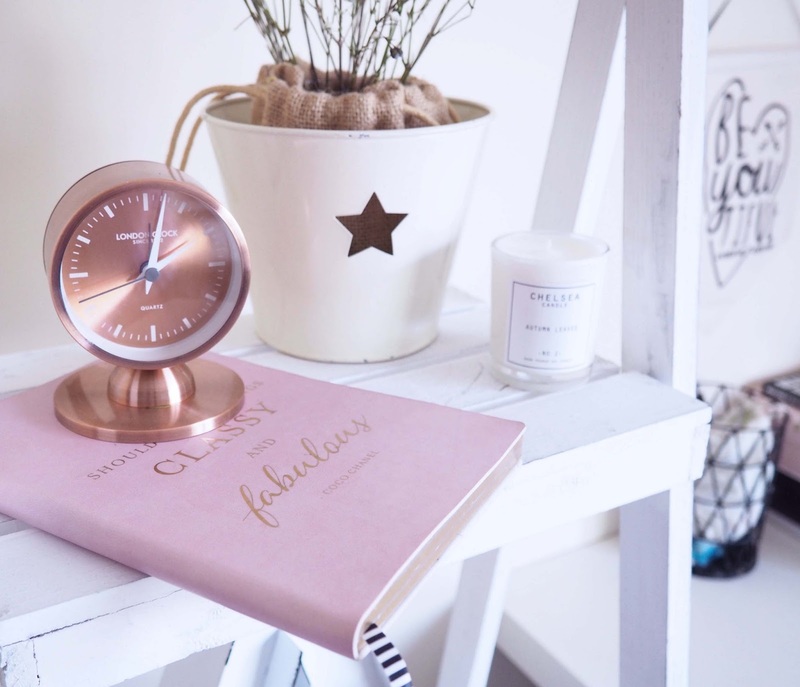 first up my lovely Urban Luxe alarm clock in copper then my notepad (Homesense) and I added my plant. i have re-used a linen bag in my planter from Amara awards goodie bag! It covered the glass and perfect upcycling! After adding my decorative items, and I was missing something to get my perfect asymmetry, so I added my Chelsea candle. perfect! First shelf done! Second shelf was petty easy! I stock up my books and placed artificial plant from Homesense on top o my Garance Dore book ‘Love, Style, Life book ( I love the cover). I love placing my book this way. I rather stick them up adding extra space, so you can add things on top! I am madly in love with this A retro block letter lamp so this was a must here! Last shelf, I played with stripes and geometry! I know, I am on very dangerous surface here but is you use it softly it works! 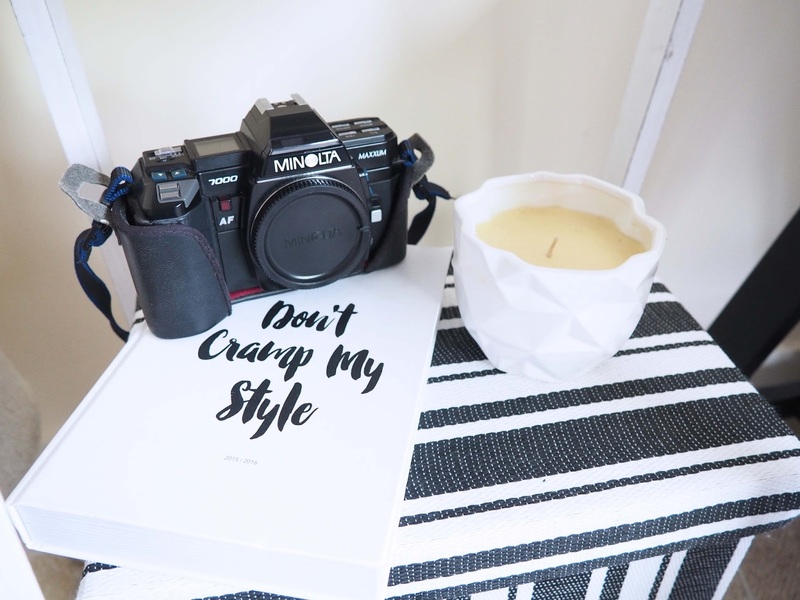 Adding a bit of typography (like my blogger planner) and vintage camera did the trick! Also, my cactuses and aloes works perfect on that little space in front! Despite the shelf, being sell as small and narrow type you actually have plenty of space to play with! I totally love Wayfair for all the items you can find there! 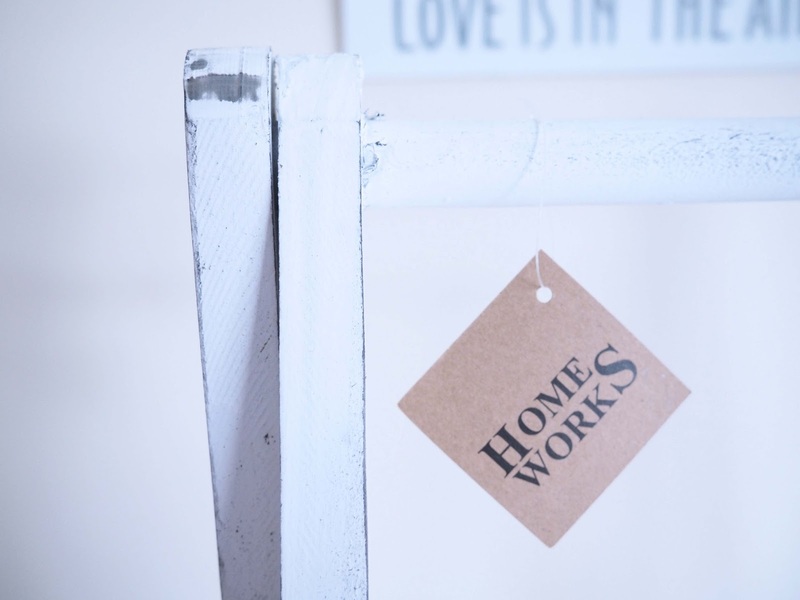 I personally use Wayfair on daily basis to specify lighting in work for clients, but I often use it to find some amazing pieces in affordable prices! What do you think of my Spring Shelfie? I love the ladder shelf. We have one of those in our bathroom. 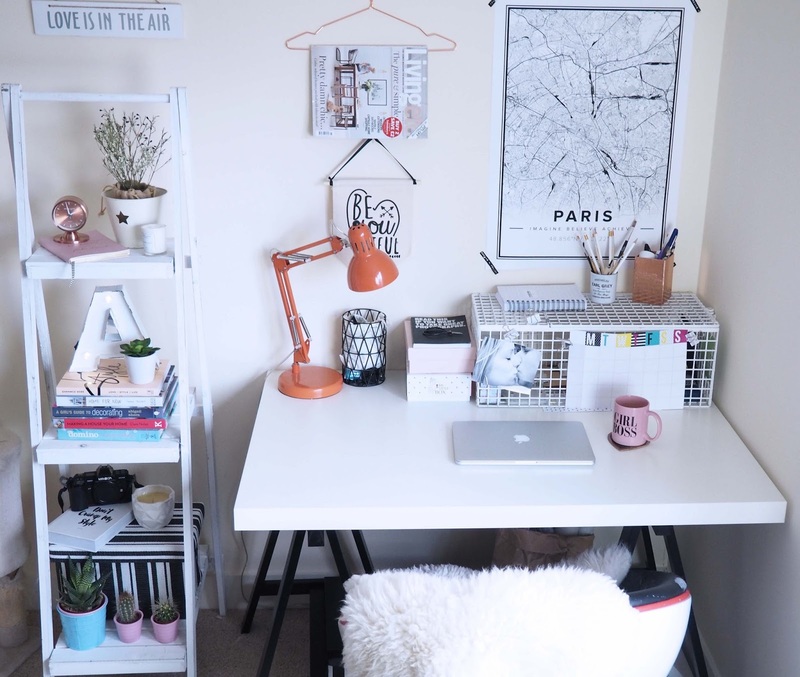 I love this look, I might do something similar next to my desk, it seems like really useful storage. I love Wayfair! Your workspace is putting mine to shame. It looks amazing! Lovely Anna! And gorgeous cat. 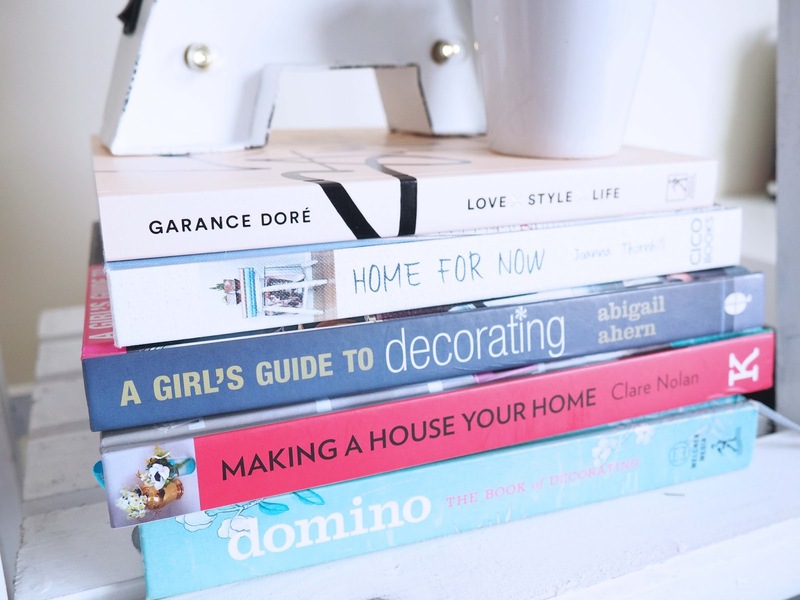 Its gorgeous, I love how you've styled it with colourful books! Really gives it a spring ready look. 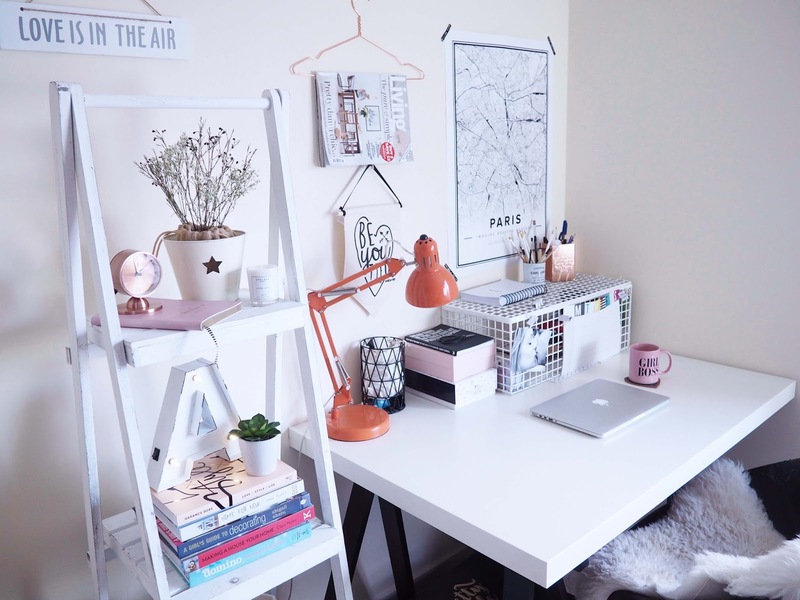 Your desk space looks lovely! And your cat is such a cutie pie too!